Joe Goode and his three sons. Courtesy of the Goode family. Joe Goode was an otherwise healthy 46-year-old with a wife and three boys in Eatonville when he was diagnosed with stage four colorectal cancer. The diagnosis and its severity came as a complete shock. Goode did not have any family history of cancer, nor any other risk factors. Three years into his battle, he now aims to speak out about the importance of getting screened, even without having symptoms or a family history. 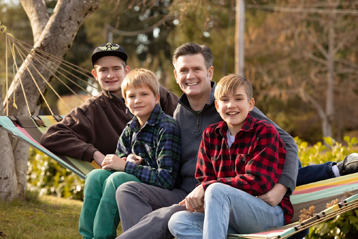 “When Joe came into my office, he was 46, and maybe he had some symptoms […], he probably had some symptoms the year before and, like anyone, he wouldn’t be worried about the colon cancer, or rectal cancer,” said Dr. Shalini Kanneganti, Goode’s surgical oncologist at St. Joseph Medical Center in Tacoma. Colorectal cancer is rising among younger individuals, leading to the recommended age for screening to be lowered from 50 to 45 years of age. About 50,000 individuals die from colorectal cancer every year, according to the Colorectal Cancer Alliance, and awareness of the disease still remains low. The disease is asymptomatic in its early stages, symptoms only developing after reaching advanced stages. This is precisely what happened to Joe Goode. Having chosen to wait for a colonoscopy, the cancer formed an obstructive mass in his colon. “I pretty much thought I had a hemorrhoid and there was no bleeding that I noticed. I was having a real difficult time having a bowel movement and that got to the point where it was like, I felt like something was blocking and, over a period of time, I tried different things, you know, the home remedies you hear about during a hemorrhoid. Nothing worked,” said Goode. Kanneganti had to perform emergency surgery to prevent his colon from being perforated. It was later discovered that the cancer had spread to his lungs and liver. This resulted in more surgeries and several rounds of chemo. She said she remembered the day Goode came into her office very vividly. Goode says the cancer put a lot of stress on his family, particularly his wife, who has supported them financially for the last three years as a truck driver. He has made some lifestyle changes since his diagnosis, with light exercise and a controlled diet. He is still undergoing treatment for the cancer in his lungs, most recently having a gamma knife procedure to remove a tumor the size of a pencil eraser. He says he is doing well overall and is thankful for support from his family, church community and team of physicians at CHI Franciscan. Goode also said that the cancer provided him an opportunity to appreciate things in life he had previously taken for granted. Seventy-five percent of colon and rectal cancers are sporadic, often occurring without a family history or known cause. While the recommended prevention is to reduce stress, diet and exercise, colorectal cancer still commonly occurs in healthy individuals. “The truth is that the cancer is widespread by the time it causes all of these symptoms so early stages of colon cancer are asymptomatic. That is why screening is so important that you catch it at an early stage,” Kanneganti said. It has always been Goode’s ambition to speak out about colorectal screenings as soon as he was well enough. He and Kanneganti were both very keen to emphasize the importance of getting screened and said that it was the most important take away from this experience.